Type and carefully proofread your resume for errors before submitting it. 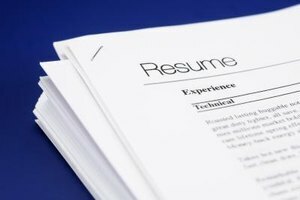 For many college students, creating a resume can be daunting, particularly if they feel they only have college classes to draw from. However, most students have a lot of meaningful experiences, in both high school and college, with which to fill their resumes. A successful college resume should include an objective, work experience, extracurricular activities and relevant coursework. Just below the heading of your resume -- which includes your name and contact information -- write a career objective or goal. This objective should be summed up in one to three sentences and should emphasize your long-term plans and current skills. The key with an objective is that it should be specific and tailored to the job or program to which you are applying. This means that you may need to rewrite your objective for each new submission. Georgia Tech suggests including three qualifications that make you an ideal candidate for the position. The education section of your resume can list degrees toward which you are working, your intended major and honors or advanced level programs in which you are enrolled. This portion can also include relevant coursework outside of the class such as interviews, presentations and conferences, exhibitions and field work. You can also include your class ranking if it is relatively high and your GPA if it is above a 3.0. Additionally, the academic portion of your resume can list awards, fellowships and honors. Sharing your employment experience with a potential employer shows you can take on responsibility. This section can include all the jobs you have held, including paid, unpaid, volunteer work, internships and work study programs. For example you can write about your babysitting job, your volunteer tutoring work and your job at the local newspaper. Lim College suggests listing at least three responsibilities and accomplishments you held for each position. Be specific in describing your role at each job and make certain to emphasize your strengths and contributions. Extracurricular activities are programs, teams or activities that are not necessarily employment or classwork. If you are a freshman or sophomore in college, it can be appropriate to include relevant high school activities on your college resume. Examples of extracurricular activities include sports, clubs -- such as chess club, Muslim Student Union, or Key Club, organizations, church activities, art, music, hobbies and community activities. The extracurricular activities sections provides insight into your personal interests and shows that you can successfully multitask. Battaglia, Soheila. "How to Make a Resume Using College Classes." Synonym, https://classroom.synonym.com/make-resume-using-college-classes-17507.html. 26 September 2017.